Follow these simple steps to complete the basic tasks when starts working with a Tenkara rod. They will help you to rig the line, attach the line to the rod and to get the best cast for this rod. Opening and closing the rod. The first stage is opening and closing the rod. It is important to know that Tenkara Rods are telescopic. Opening the rod is a simple process. This can be done quickly and easily. The first step is to remove the rod plug. Then carefully tilt the rod down to expose the rod tip. Keep the hard tip inside and expose the braided tip, called "lillian". Pull out the tip and then pull out each sub segment. Always keep the segments in the fingers, as shown in the figure. They should slide out easily. Make sure that you slide each segment out fully, before advancing to the next segment.When the segments have been fully extended they should feel snug. Do not make them too tight to prevent stuck. The next step is rigging the line. There are two types of tenkara lines; the traditional furled line and the level line . The traditional line is a furled tapered line that comes in 2 lengths; 3,6m or 4,5m.The level line is a monofilament or fluorocarbon line that you can trim to a length of your choice to suit the fishing conditions. The line is attached to the small red line, known as the Lillian, on the tip of the rod. A traditional Tenkara line has a transition loop at the thick end. This can be girth-hitched to the tip of the rod, as shown in the figure below (also look at>>). A level line is tied at the non-tippet end with a small loop which can be tightened like a lasso. Using this loop wrap the Lillian around one side three times and tighten (also look at>>). After the line is attached hold the rod tip near to the opening of the rod. The next step in the process is to attach the tippet. The tippet is a clear monofilament line which is 7x-5x and 50 – 100 cm long. This can be easily attached using the tippet rings. These are small stainless steel rings which are at the end of the traditional furled line. The tippet will thread through these like the eye of a hook. 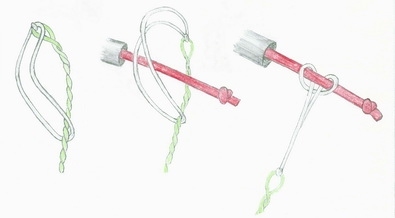 The knots are small and reduce drag when casting, or in water. To attache the tippet to traditional furled line, use a knot of your choice, or "yamamoto knot" as shown in the figure below. To attach the tippet to level line is easy by the spanning loop at the end of the tippet. Make the knot an the end of the line, then span the loop. The final section of this process is attaching the fly to the tippet. Select your fly and use a knot of your choice to tie it to the tippet. The line is totally rigged and you can extend the rod. Start at the tip and extend the rod in segments until it is fully extended. Do not pull the rod too tight or it might become stuck. You are ready for fishing. The correct way to hold the rod is by placing and index finger on top of the grip. For western fly fishing the thumb is placed on top of the grip. The amount of pressure applied to the grip varies and depends on the individual. 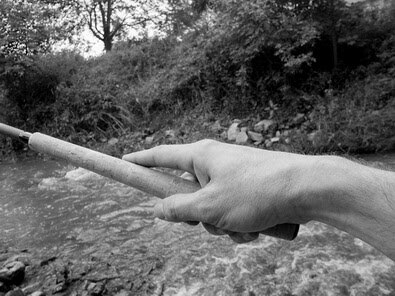 The rod may be held loosely, but it is important to hold the rod tight enough so that it does not fly into the water while casting. Practice casting to get the perfect grip. The Tenkara rod is easy to use. Begin by holding the tip in a horizontal position. The elbow of your casting arm should be a fist width away from your side. Raise the rod tip to an 11:00 position using your elbow and wrist. Pause to allow the rod to load the line. Using your wrist cast out the line. Point the finger on top of the grip towards the target. To practice use a target on a hard surface, like a paper plate in the garden, until the technique is perfect. The most important thing is to enjoy the fishing. All of the steps may seem complicated but take each one in stages and it is easy. For further advice on casting check out “Oni” Masami Sakakibara casting. Pay your attention to this Daniel's video, evidently the best in web. Do not worry is you snag bushes, trees or rocks that happens to everyone. Also, if you do hook a fish, do not worry, that is normal. Just raise the rod, then pool in the line, and collect the fish. Remember for bigger fish you will need a landing net. And, to learn more, go to Tenkara fishing library to Equipment and Technique pages.